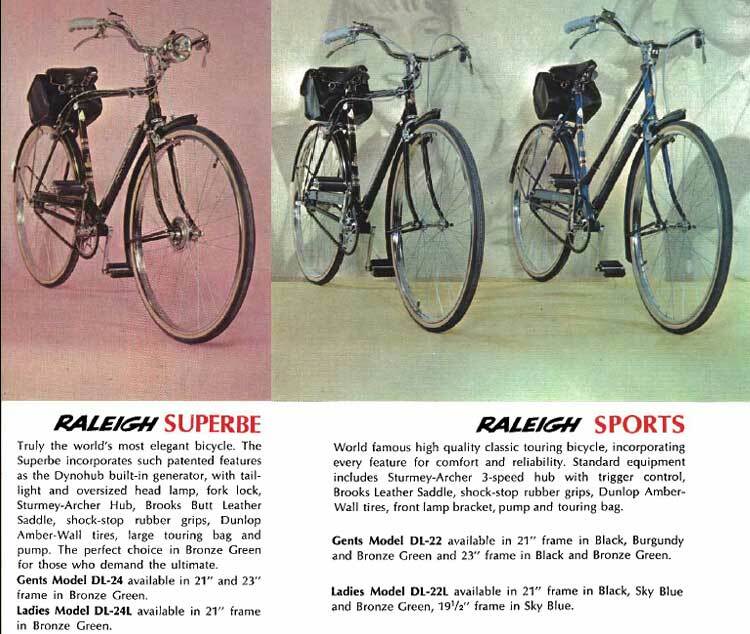 The Raleigh Sports and its deluxe sibling the Superbe were the flagships of Raleigh's line of utility bikes. For many years, in many parts of the world, the Raleigh "Sports" three-speed bicycle was considered the ultimate in human-powered transportation. These bicycles were not toys, and, despite the model name, they were not sporting equipment...they were serious vehicles. The men and women who built them, by and large, also rode them, as their primary means of transportation. Most modern bicycles are designed with the primary intent to catch your eye on the sales floor, and persuade you to buy. That is not what a Raleigh Sports was about...these were designed to provide solid, dependable transportation for the British public, at a time when only the upper classes had motorcars. These bikes were built to last 100 years, with reasonable care. Contemporary bicycles have many parts made of aluminum (or "aluminium," if you prefer) for lightness, strength and corrosion resistance. Contemporary bicycles that have steel rims, or cranks, or handlebars, or brakes do so as a way of cutting corners and saving a little bit of money, for a low-end bicycle. Modern steel rims, cranks, etc are of low quality, because they are aimed at the cheapest possible price point. From the mid 19th century, well into the 20th, the word "steel" was magic in Britain. Britain's rise to an industrial superpower on the crest of the Industrial Revolution was based, as much as anything else, on the steel industry and the new technologies it made possible: steel ships, steel bridges, steel buildings...and steel bicycles. Raleigh originally introduced the slogan "The All Steel Bicycle" to differentiate Raleighs from competitors who used cast iron for some critical parts, a heavier and cruder technology. 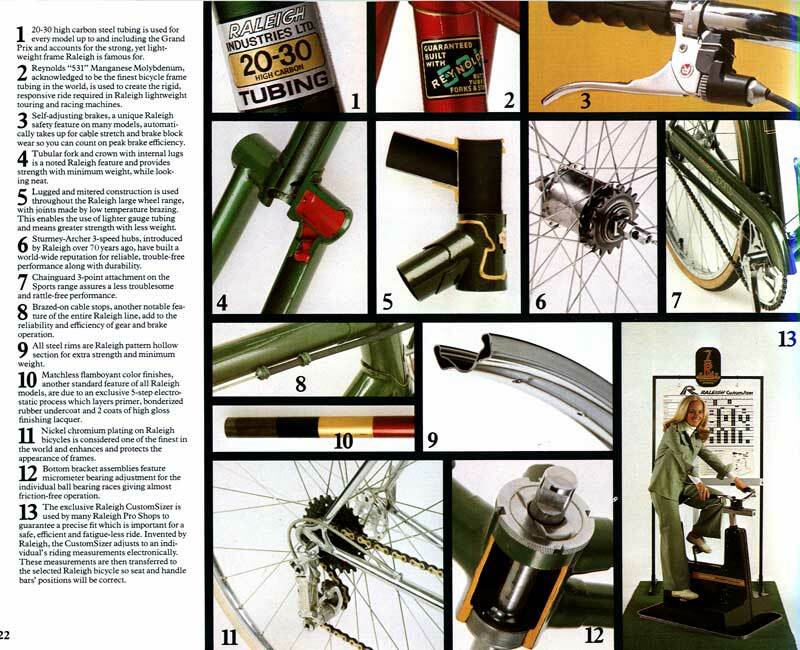 The mystique of steel caused the British cycle industry to be slow to adopt newfangled materials such as aluminum, and many British cyclists believed, even well into the 1960's, that steel rims, for instance, were superior to aluminum ones. These days, this seems laughable...but if you look at an older Dunlop steel rim, you'll find a very respectable, well-made product. 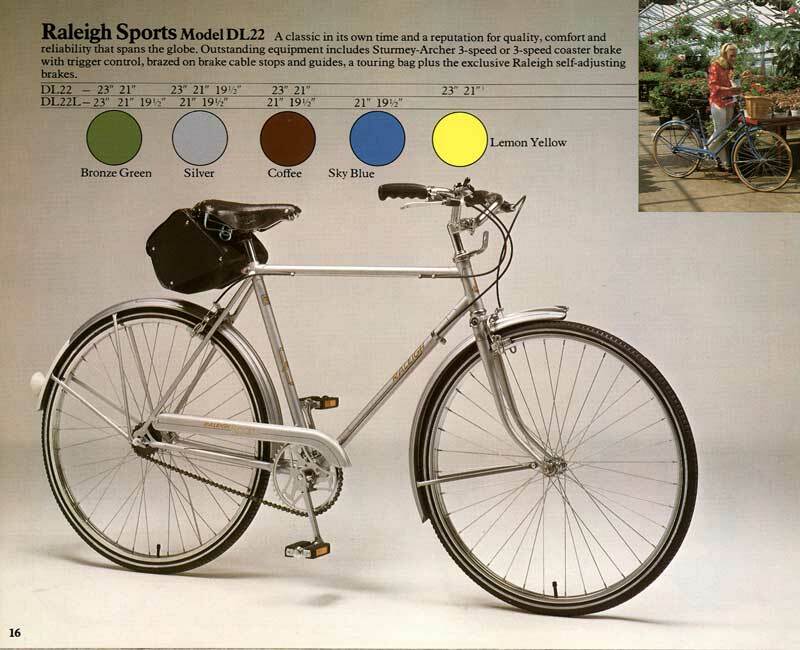 The fact that Raleigh 3-speeds are made of steel shouldn't fool you into thinking that these bikes were cheap or inferior in any way...they were not...they were the finest utility bicycles money could buy. Raleigh 3-speed bicycles were introduced around the turn of the century, and kept improving in technology over the years, reaching a peak in quality probably in the mid-to-late 1950s. They continued to be built in Nottingham until the mid-1970's, when the glamour of the 10-speed fad pushed them out of favor with the rising baby boom generation. The "Superbe" was a deluxe version, of the Sports. The Superbe usually came with a DynoHub lighting system, key locking fork, luggage carrier and upgraded saddle (Brooks B66 instead of the B72 used on the Sports. It's an interesting sign of the times that the 1962 catalogue copy suggests that the Dynohub would be "ideal for emergency lighting in your fallout shelter." 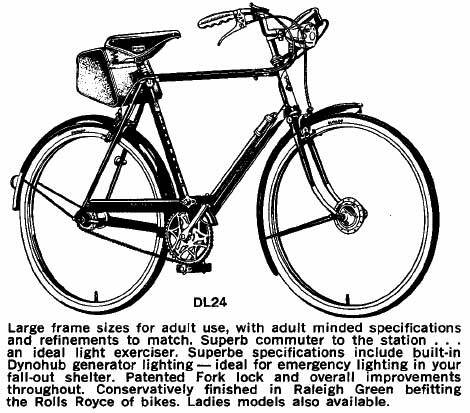 For reasons of marketing, Raleigh made equivalent bicycles under the "Rudge" and "Humber" name. The top-line Raleigh/Rudge/Humber models had a number of features that set them apart from lesser models, even lesser Raleigh products.